Opt-in required, x1 per customer, new Vegas customers only. £10 buy-in required to receive £30 bonus, with 50x wagering on bonus. Bonus expires 7 days from issue. Game, player, currency and country restrictions and terms apply. One of the biggest names in the UK’s gambling industry, the William Hill brand has been around since 1934 and their royal blue colour scheme is instantly recognisable on high streets up and down the country. In keeping with the times, they now offer an online casino experience for their customers and in this William Hill Vegas review, we’ll tell you all you need to know about how to get your hands on their promotions and sign up bonuses, with no promo codes required, including their offer of 100% cashback for new customers. When first visiting the website, you’ll notice that the customary royal blue theme is present throughout and in terms of layout, this particular site has appeared to follow the trend, with their most popular games taking pride of place towards the top of the page. When navigating through the site, it is clear to see that this William Hill tries to offer an authentic Vegas experience, especially when playing the live casino games and there are subtle references to sin city throughout. So what welcome offers, promotions and bonuses can we expect through a William Hill Vegas promo code? Well there are some great offers available to new players, and you only have to be new to the Vegas portion of the brand. 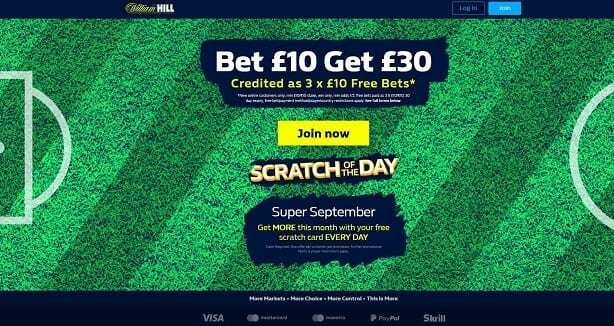 If you have previously played at William Hill Bingo or any of their other verticals you can still make use of the welcome offers. As for existing customers, there are other bonus promos that run regularly on the site and these can be found by scrolling right to the bottom of the home page and clicking on the ‘Promotions’ button. Here, you’ll also be able to find out about new games that have just arrived, or will be arriving shortly and you’ll often find that free spin promotions and special offers often go hand in hand with these launches, so it is definitely worth keeping an eye on. As we touched upon earlier and as the name suggests, William Hill Vegas prides itself on being one of the best online casinos in the industry and this is reflected in the games and features that appear on the website. The jewel in the crown is most definitely the selection of live casino games which includes Live Roulette, Live Blackjack, Live Baccarat and Live Casino Hold’em. As well as having top-notch graphics, interactive features and excellent sound quality, users can also benefit from real-time play and revolutionary chat features which transcend the experience to a new level. It really is a close as you can get to being in a casino but from the comfort of your own home. However, their focus on live casino games is not to say that they neglect their other features, you’ll still find a healthy selection of slots, video slots and table games. Being part of such a big brand only benefits this online casino, as it is home to some exclusive features that you simply can’t play anywhere else. Titles such as Super Fortune Dragon, Congo Bongo, Mayfair Magic and Hansel and Gretel are reserved for William Hill Vegas customers only and are often linked to the Vegas Millions progressive jackpots, meaning the rewards for playing are potentially huge. One thing that’s clear is that this site clearly opts for quality over quantity. There is not an overwhelming number of activities available, but the ones that are, are all of the highest quality, from their sharp graphics and crisp sound quality, to their rewarding in-game features and incentives. As you’d expect from one of the biggest names in the business, depositing and withdrawing funds from your account is a seamless process and you won’t be charged for either transaction. In terms of payment types, you can use most debit and credit cards, as well as increasingly popular e-wallet systems, such as NETeller, Skrill casino and Paypal for casino games. The minimum deposit amount is £10, which is pretty standard across the board nowadays and you can expect to wait up to 2-3 working days for your withdrawal to be processed. One of the benefits of gaming with a huge corporation is that their customer service experience tends to be a cut above the rest and it is much quicker and more efficient than some of the smaller, independent online casinos. We’ve found that the best way to get in touch is to use the LiveChat function that can easily be found via ‘Contact Us’ page on the website. You’ll need to ensure you login before doing this. Alternatively, you can use the free phone telephone number, or send an email if your enquiry is not urgent. With regards to mobile casino compatibility, you can play whilst on the go with your smartphone or tablet in one of two ways. Firstly, you can download the William Hill Vegas app, where you will be able to login to your account and start playing instantly, as you would on the desktop version. The app, however, is not a necessity, you can simply type the URL into the search bar on your chosen mobile browser and this works just the same. When scaled down, the website doesn’t lose any of its charm and the catalogue of games and bonuses remains largely the same, which is a big plus for us, as sometimes it can feel like you are being penalised for playing the mobile version of a gaming website when some of your favourite titles aren’t available. For another great mobile app, check out our Phone Vegas review and see what’s no offer with this alternative brand. We also like that nothing gets lost in the crossover, the home page looks almost identical on both platforms, with the login and signup buttons still prominent and easy to find on the William Hill Vegas app, at the top of the page. A big brand, a big website and big expectations means there is no room for error when it comes to games content and software affiliations. It’s safe to say that this Vegas-themed online casino definitely does not disappoint, as it works with developers such as Microgaming software, Evolution Gaming, Ash Gaming and Net Entertainment to bring you an unparalleled number of exclusive video slots. NetEnt and Microgaming, in particular, are famed for their fine designs, generous promo code offers and varied number of jackpot winning opportunities, which is why you’ll often find their games on the biggest and best slots sites in the business. All in all, it’s safe to say that as far as online gambling goes, our William Hill Vegas review puts this up there with the best casino sites. It’s clear they have a sizeable budget and no expense is spared to ensure users are constantly provided with the best content available, thanks to its affiliation with some of the most esteemed software developers. Although the catalogue of games isn’t huge, there is still plenty to keep you engaged and the quality provided means you probably won’t find yourself yearning for a wider selection. As we’ve mentioned, the sign-up offer for new customers could be improved, but it certainly shouldn’t be scoffed at, and once you have signed up you can login and go to the promotions page to keep up to date with their latest offers and bonuses. There are certainly more pros than cons for this website and we like the fact that a lot of focus has clearly gone into making sure they offer high-quality content and create a top-quality user experience from the moment you sign up, to the moment you cash out.